The most anticipated, most hyped season in UB football history begins on Friday with the start of training camp. Like any college football team preparing for the season opener, the Bulls have some questions to answer and holes to fill leading up to their September 1 opener against Delaware State. With 16 of 24 starters returning, including some of the top players in the Mid-American Conference, there has never been fewer questions that needed to be answered. That has led to a buzz around the Bulls that is unprecedented. There are numerous and real reasons for UB fans to be excited. It started with last season, when the Bulls finished 6-6 and bowl eligible. They won their last three games, never lost a game by more than 10 points and led the MAC in passing. That hype has rolled into 2018. The team was picked to finish second in the MAC East, the highest the Bulls have ever been picked. They have six players on nine different preseason awards watch lists. Again, more than the program has ever received. If you’re a fan of the NFL Draft, you’ve likely noticed that three Bulls (Anthony Johnson, Tyree Jackson, Khalil Hodge) are being mentioned among the top prospects for 2019’s Draft. Johnson has the potential to be a first rounder. Jackson, a junior, has two years of eligibility remaining but the NFL is already salivating over his arm, athletic ability and 6-7, 250 pound frame. That is the foundation the Bulls will build on for this season. But there are other holes to fill and position battles to be determined. The biggest question, and best battle, will be at running back. Emmanuel Reed returns off an 840 yard, 9 TD season. He is the clear starter. But last year’s starter before Reed, Johnathan Hawkins, is back after missing most of the 2017 campaign. Hawkins is very talented, but has struggled to stay healthy and take control of the job. Theo Anderson, a powerful 230 pounder, ran for 419 yards last year. There are also young backs who could challenge Reed and Hawkins. Redshirt freshman Kevin Marks is the fastest Bulls back. Freshman Jaret Paterson is quick and shifty. Both should see the field this season. The offensive line has two starters to replace. James O’Hagan is set at center, Evan Ksiezarczyk at left tackle and Tomas Jack-Kurdyla holds down right guard. There is depth on the line from last season, and those players will contend for the two open spots. Kayode Awosika played five games at right tackle in 2017. He’ll battle Jacquis Webb for starting spot. Paul Nosworthy played 11 games at left guard, and he’s the frontrunner to win that job. The receivers are set, with Johnson joined by K.J. Osborn and Antonio Nunn as the starting three. Wisconsin transfer George Rushing will likely be the fourth wideout, with a group of young freshman pushing for the remaining backup spots. Speaking of backups, Drew Anderson transferred to Murray State and is no longer around to play behind Jackson. Kyle Vantrease was last year’s #3, and started one game. He is the likely #2 this season. Dominic Johnson and West Seneca’s Matt Myers, the WNY Player of the Year, will push Vantrease and compete for the third spot. Tight end is set with Tyler Mabry. Backup Zac Lefebvre is coming off an injury, and will be pushed by Julien Bourassa and Cole Burniston. The Bulls offense is explosive, and Jackson should be the best quarterback on the field almost every week. This will be the strength of the team, and they should approach averaging 35 points per game. That takes some of the pressure off the defense. Holding teams to 21, or even 28 points, should get the Bulls a lot of wins. Compared to the offense, there are a lot more holes to fill on this side of the ball. Only six starters return. There will be two new defensive lineman, one new linebacker and two new safeties. It’s good that defensive stars Hodge, DE Chuck Harris, DT Justin Brandon and all four cornerbacks return. That core on defense will be counted on until the unit gels. The Bulls heavily recruited size at defensive tackle to line up next to Brandon. A host of junior college transfers will join returners Chibueze Onwuka, Jake Khoury and Wes Scott. Watch out for 300 pounders Atu Vainikolo, Eddie Wilson and DeShondrick Foxworth. Defensive end will be manned by returners Myles Nicholas, Malcolm Koonce and Kennedy Emesibe. Ledarius Mack, Khalil’s brother, has also been moved to end from linebacker. Jordan Collier joins Hodge as returning starters at linebacker. Young players Kadofi Wright, Justin Mulbah, Ja’Varius Harrison will bring more speed and athletic ability to the outside spot. That’s a position where the Bulls value speed and quickness over size, a requirement in today’s college game where spread offenses dominate. The strength of the defense is at cornerback, and that’s a good strength to have. Cameron Lewis is an All-MAC caliber player and the team’s top cover man. Fellow senior Tatum Slack isn’t far behind in talent. Brandon Williams is a veteran of 10 career starts. He saw some time at safety during spring practice and could be moved to bolster that position. Add in another senior, Devon Russell, and the team has experience and talent at a crucial position. Both starting safeties graduated form last season, which leaves two holes to fill. Returners Jeremiah Dadeboe and Dev Lamour have seen some action as backups. They will be pushed by JC transfer Joey Banks and a host of young players. Improving on last year’s middle of the pack MAC defensive rankings is a major goal. That, along with the offensive attack, should be enough to make this unit successful. Kicker Adam Mitcheson returns, and has a good chance to set the school record for points and field goals. He will need to cut down on a MAC-high nine missed field goals. The team will have a new punter, as Evan Finegan takes over for departed senior Kyle DeWeen. Long snapper Jeremiah Riordan also returns. Kickoff returns will be different this season, with a new rule that allows a fair catch inside the 25 yard line that brings the ball out to the 25. But Osborn can be explosive as a returner on kickoffs and punts. Simple for a veteran team on the brink of a special season. They need to stay healthy, and find starters for the open spots. Most of the system learning has been done during the spring and summer. With so many veterans returning, camp should be about refining the performances and preparing for the season. 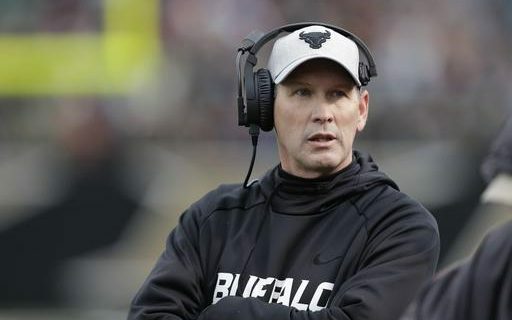 Head Coach Lance Leipold’s biggest job will be managing expectations, a new phenomenon for these Bulls. The hype is real, and making sure the players stay focused will be equal to any X’s & O’s teaching. Bulls fans have been waiting for a season like this, when they know their team is fun to watch and has a chance to dominate. The wait is over on Friday.